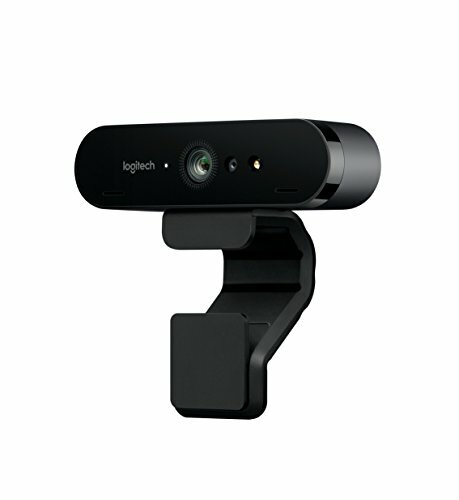 Logitech is bringing Ultra HD video quality to their famous webcam line with the brand new BRIO. Equipped with high-tech optics and lenses to help deliver razor-sharp images, the BRIO offers professional-level visuals in one small, easy-to-understand package! The BRIO is capable of recording, streaming, and calling at full 4k Ultra HD. Clearly see all of the details and colors that pop out on any screen. 1080p and 720p video resolutions are also available. In addition, Logitech’s own RightLight 3 aids in correcting the lighting of your surroundings. It will automatically adjust the image quality to compensate for too much or too little light with High Dynamic Range (HDR) capabilities. Look great no matter where you are! Additionally, the BRIO’s powerful 5x digital zoom allows you to focus on important things with precision. The BRIO has three different field of view settings to choose from: 65°, 78°, and 90°. This webcam only shows what you want, whether you’re having a private conversation or showing a wider view of your surroundings. Two omnidirectional microphones amplify your voice in your video call or recordings, allowing you to be heard clearly, while noise-cancelling technology helps filter out any unnecessary sounds. Get only the best video experience without a complicated set-up! This webcam also has great infrared facial recognition capabilities, with the ability to easily distinguish your features thanks to its Ultra HD image quality. This makes it great for fast computer logins with Windows Hello and other facial recognition apps. The Logitech BRIO is compatible with Windows 7 or later, Mac OS 10.10 and up, Chrome OS, and Cisco. It can be used with most video-calling apps such as Skype, Facetime, Facebook Messenger, Line, ooVoo, and more. The BRIO is certified for Skype for Business and can be used with Microsoft Cortana voice control. Additionally, mounting the webcam in multiple positions is easy thanks to its removable clip. Install it on your monitor or your desk without difficulty. An embedded tripod thread allows you to combine the BRIO with a tripod for flat surfaces. Powered by a USB 2.0 and 3.0 connection, simply plug the webcam into your computer, and you’ll be good to go. USB 3.0 is required for 4k video output. ENTERPRISE-READY: Certified for Skype for Business and Cisco, and compatible with popular video meeting apps including Zoom, WebEx, BlueJeans, Facebook Messenger, and more!